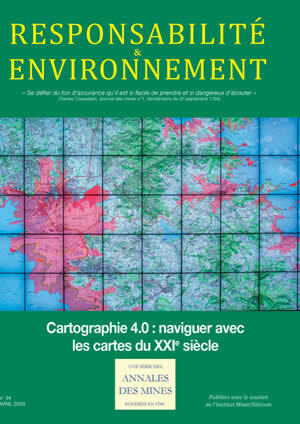 iTowns est une plateforme technologique de l’IGN qui permet de visualiser des données géogra­phiques 3D via le Web et propose des fonctions d’interaction avancées dans un environnement métrologique. Visualization is a user-preferred mode of interaction for geographical information. An effective graphic representation of geographical data is all the more important when the data are massive and diverse, and when users and uses are varied. Moving beyond the 2D visualization on a map printed on paper or displayed on screen, 3D visualization raises new issues. Appropriate tools are needed to handle the volume of data and multiplicity of formats, and to manage the visualization and styles to be applied as well as interaction and browsing features. The IGN’s technological platform for visualizing geographical data in three dimensions on the Web, iTowns, proposes advanced features for interactions in a metrological environment. Initially designed by the IGN’s research laboratories for visualizing data from images and LiDAR (images coming from a moving vehicle equipped with sensors), iTowns has evolved and can now be used for immersively browsing a large volume of 3D data on a range of scales from space to ground level. Interfaces are available for manipulating the data. As the 3D visualization engine of Géoportail, iTowns is continually being endowed with new features. Besides 3D visualization for the general public, it can be used to develop professional Web applications for co-visualizing different types of data, annotating them, and then making analyses, measurements, etc.